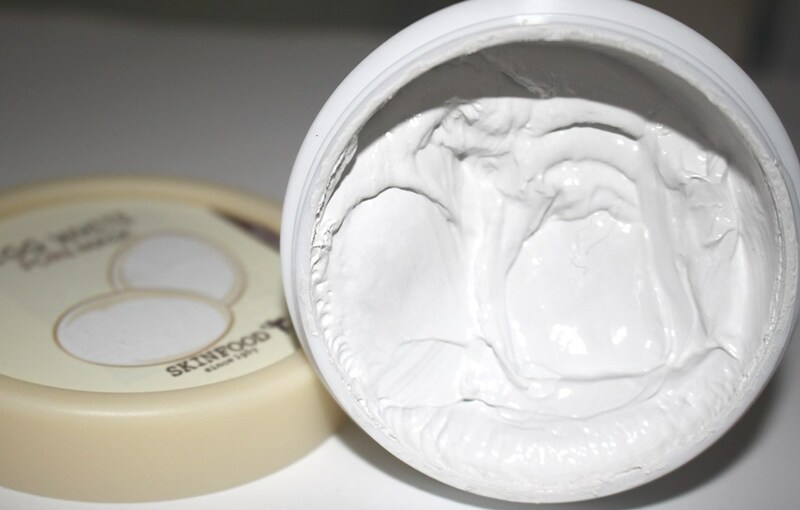 The Skin Food Egg White Pore Mask claims to be a pore-refining mask with egg white extract that penetrates deeply into pores to remove pore-clogging oil. 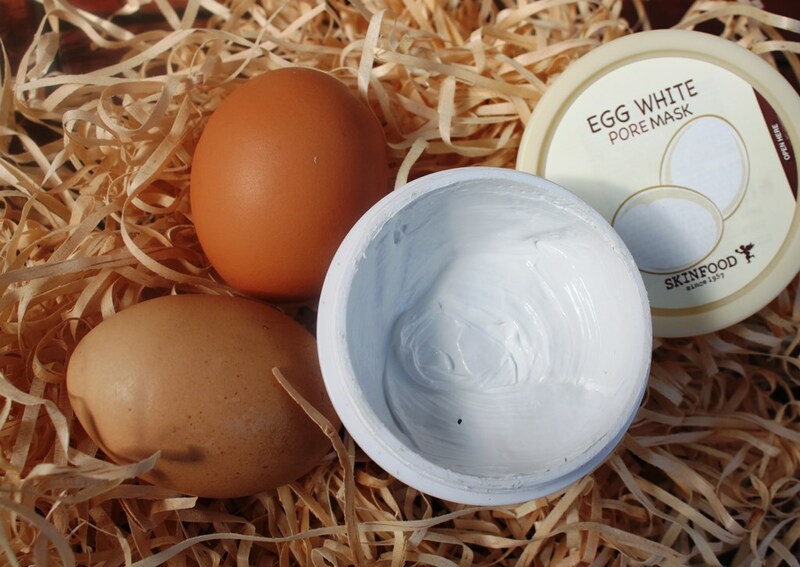 Egg white masks are thought to be effective in treating a number of skin problems due to high protein content which can yield improvements in skin tone, elasticity and in turn the appearance of wrinkles and fine lines. Egg whites have astringent properties that help shrink pores by tightening the skin and thus naturally pushing out any build up in the pore itself which can lead to blackheads. However, cosmetic chemist Randy Schueller isn’t convinced of egg white’s pore-refining benefits. I’m not aware of any mechanism by which egg materials could remove sebum or dead skin cells… Eggs do contain albumin protein, which is a good film former. This makes your skin feel tighter. Albumen, the protein contained in egg whites, (sometimes spelled albumin), appears after fragrance in the ingredient list, indicating that it is perhaps not as vital to the formulation as we might think given the name of the product. The white appearance certainly implies whipped egg whites however the colour is due to the high amount of Titanium Dioxide, a naturally occurring mineral used also for thickening. The pore cleansing properties of the mask are more likely due to the much higher concentration of Bentonite and Kaolin clays. These help to naturally exfoliate the skin, pulling out impurities, balancing facial oils and unclogging pores. Responsible for retaining or perhaps enhancing skin hydration are the humectants, fatty acids and emollients in the formulation. These are included to ensure that in drawing out impurities the mask does not cause a drying effect. These include Glycerin, Caprylyl Glycol and Betaine humectants plus Caprylic/Capric Triglyceride, Panthenol, Cetearyl Alcohol, Palmitic and Stearic Acids, Peg-100 Stearate and Olive Oil. Lactic acid is an Alpha Hydroxy Acid (AHA), exfoliating to help reduce acne breakouts and the appearance of wrinkles and other signs of ageing. Finally Sodium Hyaluronate, the salt form of Hyaluronic Acid is a water-binding ingredient allowing skin to retain water and create a plumping effect. As the name suggests, Skin Food products are packaged to look like items you might find in your pantry. It’s a cute point of difference which sets them apart from the rest of the market. The mask is presented in a plastic screw top lid container with inner protective cap and no spatula for dispensing. 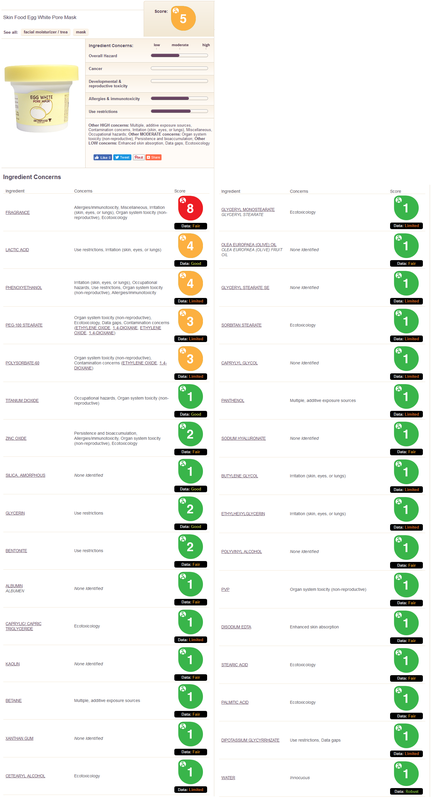 Both the CosDNA and EWG reports raise warnings against fragrance and lactic acid, the former the main concern for those with sensitive skin. After cleansing, apply to the face, avoiding the eye and mouth area. After 10-15 minutes, wash off thoroughly with warm water. Due to the subtle nature of the Skin Food Egg White Pore Mask scent, it is difficult to describe, suffice to say it is very mildly perfumed and hardly noticeable. 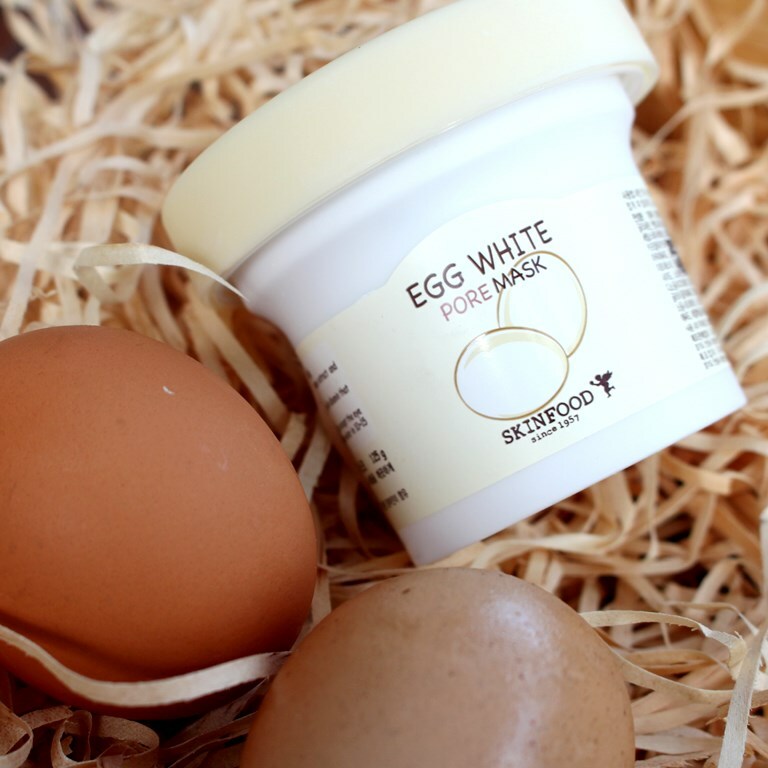 The 125 gram pot of Skin Food Egg White Pore Mask has a recommended retail price of US$10.50. 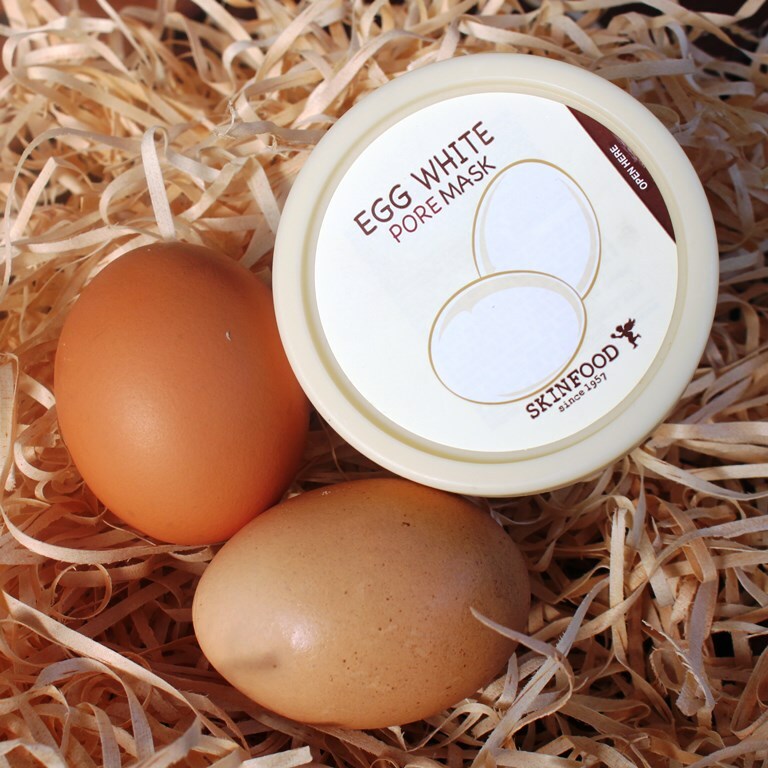 You can purchase the Skin Food Egg White Pore Mask on many Korean online skincare boutiques. The product has a long shelf life of 30 months. The packaging is simple and quirky however, there is no spatula included for dispensing the product. Nonetheless, I have scraped it out with both my fingers and a brush and have not experienced any issues with bacteria so it is safe to assume there are sufficient preservatives to maintain hygiene. The texture is very thick so it is easier although messier to apply with fingers. Instructions advise leaving it on, avoiding mouth and eye areas, for 10-15 minutes. As with all my wash-off masks, I like to leave them on longer than the suggested time. I tried this one for 15 minutes and on other occasions right up to 40 minutes and the results are the same, so in this case, extra time doesn’t enhance the effects. Once the prescribed time lapses, the mask takes on a hardened form, although it is not stiff so you can still freely speak and exercise face muscles without discomfort. It will rinse off with water and gentle massage but I prefer to remove this one with a warm, wet face cloth. Upon removal, skin looks brightened and refreshed as you would expect with most clay based masks. Reflecting on the manufacturer claims, the mask certainly does clean pores thanks to the kaolin and bentonite content. I doubt the egg white contributes anything at all given its low concentration implied by a position of item 30 in a total ingredient list of 32. For the record, there is more fragrance added to this product than egg white. The added humectants and emollients ensure that the effect of the mask is not at all drying. Skin retains a feeling of suppleness and hydration afterwards. As for the claim that egg white extract penetrates deep into the pores to remore pore-clogging oil goes, I doubt that very much. This is a very gentle and effective mask. Titanium Dioxide is added to give the solid white colour to the formulation and hence the appearance of whipped egg whites. Perhaps the brand culture of enforcing food like presentation influenced the way this product is marketed, even though the egg content is probably negligible. 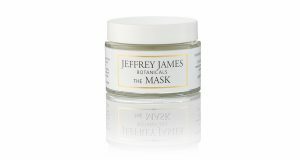 The clay assures pores are purified and balances oils. It is a very easy mask to wear and perhaps a good choice for those with sensitive skin or beginners looking for a gentle pore cleansing product. Hi! Thank you for sharing this with us. I would like to know if I can use this product on a daily basis or should it be twice a week only? Thanks again! Thanks for your great question Andrea. Essentially, this egg mask is a clay mask so I wouldn’t recommend using it more than a couple of times a week.